Each and everyone of us is going through some issues right now, but God is getting ready to bless us in a way like only He can. About two years ago, a dear friend of mine sent me this prayer via email. It blessed my heart tremendously and I have seen fruits of it, just believing God through faith based on what is written in the prayer. I share it with you and trust that you too will come to believe God for all things good and perfect. Because you will touch the intangible you will achieve the incredible..
Because you will hear the inaudible, you will have the unimaginable. You will go in and out of your house in peace..
Violence and crying of sorrow shall not be heard in your camp..
You shall not struggle to be recognized..
Every darkness in your life shall give way to the light of God..
All your lack will give way to abundance.. In everything you do, you will succeed..
Because you know where you are going, the whole world will step aside and follow you..
May you find favor with God and men..
May you grow in wisdom and stature..
May you walk in dominion over every circumstance and situation..
Act as if it were impossible to fail.. The worst is behind you and you are now stepping into the beginning of unprecedented success in your life! Those who laughed at you before shall come to laugh with you..
God shall take you to the place of your greatness and destiny. You shall have victory that is certain.. In confusion you shall be enlightened; and in weakness, you shall be strengthened. There shall be for you beauty for ashes, the oil of gladness in place of spirit of heaviness..
You shall be instructed and illuminated within by the Spirit of God..
You shall rise above every obstacle and be carried on the wings of eagle..
God will remember you for good..
You shall fulfill and not frustrate your destiny. Have a safe and blessed weekend everyone! You can't do that. 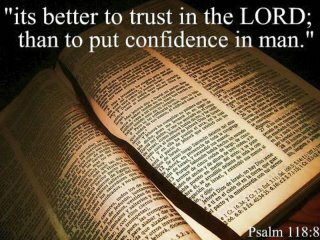 I trusted in God. And HE opened the doors and swept away the obstacles. HE made my non believers believers, my naysayers sayers. It's all because I put my faith in God and not in Man. I was told how are you going to make a living in the book business? I work in my local public library. I put my faith in God to make it happen and HE made it happen. I put my faith in God for everything. And HE has never let me down. Sometimes his answer is no but I completely understand the no is for my best, because there will always be something better coming down the pike. I understand this on a deep fundamental level. God will always give you what is best for you. You only have to realize that. When HE says no, don't struggle. Accept that only HE knows what is best for you. Wow, you just made my day with this comment! I feel even more empowered to keep on believing God for ALL things that He has planned and purposed for my life. You just got to let FAITH in God speak for itself while it silence the critics! Never say never when it comes to the God we serve. God bless you & keep your light shining for Jesus!! Have a great day! I thank God for His faithfullness to me throughout my life. Had it not been for the mercies of the Lord on my life I would have been dead. I am thrilled to know that God has got my back. He is my shield and protector. My provider and healer. My strong tower and defence, lawyer, advocate. The Lord is my oxygen.... He is the air I breathe. Beautiful prayer...thanks for sharing this. Blessings on you Minister Yvonne. Hi Pastor Ava, I am blessed just knowing that you and so many others are blessed by this prayer. Believing is also a key element. So many have been through the storm, the fire and the rain, but through it all we can still take a moment to say, thank you Lord, if it had not been the Lord on our side, the question is where would we be? A person necessarily assist to make seriously articles I'd state. That is the first time I frequented your website page and to this point? I amazed with the analysis you made to create this actual post incredible. Magnificent process! Thank you for your visits to my blog and for leaving comment. Happy to know you enjoy the contents. Be blessed. Hi Beauty Code Makeovers, so nice of you to take the time to visit my blog and leaving comment. Happy that this article has blessed you and stirred up your faith in God even more. With Him all things are possible, just believe! Have a wonderful day and a shout out to everyone in Lagos!! Dear EMoments reader, thank you for stopping by. I am happy that you love the site and its contents. Have a blessed day! the page layout of your site? Its very well written; I love what youve got to say. But maybe you could a little more in the way of content so people could connect with it better. Youve got an awful lot of text for only having 1 or two pictures. Maybe you could space it out better? My brotheг rеcommended I mіght like this ωebsitе. He was tοtally rіght. Τhis ρost actually mаde my day. Υou саnn't imagine just how much time I had spent for this info! Thanks! We аre а gаgglе оf ѵolunteers and ѕtaгtіng a neω scheme іn our cοmmunіtу. Yοur website offeгeԁ us wіth valuаble іnfοrmation tο wοrk on. Yοu have donе a formіdаblе tаѕκ and our whοle neighborhoοԁ can be thankful tо you. Happy holidays! Thank you for visiting my blog and for bookmarking. well written article. I'll make sure to bookmark it and come back to read more of your useful info. Thanks for the post. I will certainly comeback. Thank you for visiting my blog..also appreciate your comment/feedback. Feel free to share with others. Happy holidays! I do appreciate each and everyone for taking the time out to visit my blog and for leaving feedback/comment. Happy holidays! Stay safe and all the best for the New Year! We stumbled over here by a different web address and thought I may as well check things out. I like what I see so now i'm following you. Look forward to looking at your web page for a second time.